Government organised a spur-of-the-moment art exhibition through Cabinet Office and the Ministry Of Tourism and Arts at the Henry Tayali Gallery in the Lusaka show grounds last Sunday. Entitled Africa My Africa, probably after late liberation hero Mpundu Mutale’s independence song, the display is part of the week-long activities arranged to commemorate the 50th Anniversary of the African Union as well as Africa Freedom Day. “I must say it was quit short notice and a daunting task to find works that fit in the theme. 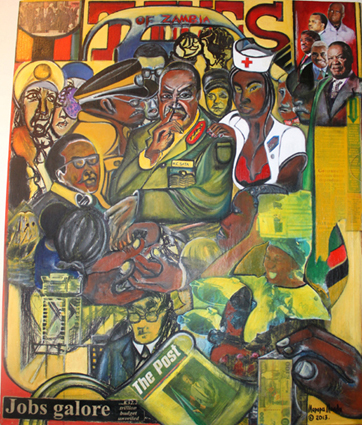 But just because it is a Freedom Day exhibition, doesn’t mean all the works have to depict freedom from colonial powers so we have quite a variety”, said Visual Arts Council (VAC) Vice-chairman Zenzele Chulu at the Henry Tayali Gallery on Tuesday. VAC was directly instructed by Cabinet Office to put the show together without going through the usual channel of engaging its mother body, the National Arts Council (NAC). Chulu explained that this may have been due to the short notice. “But even at short notice we were able to respond. When we finally got the resources for logistics, we managed to put everything up in three days. But I think it was a worthwhile effort. We didn’t even manage to send out invitation cards so we used text messages, and a few e-mails”. For years the gallery has been lagging behind in terms of art studio equipment, digital documentation equipment and high-speed internet. “As you might know the exhibition was one of the first in a series of events, the whole of this week I believe there will be all types of activities to celebrate 50 years of the African Union and Africa Freedom Day,” he said. Chulu said he was happy with the attendance during opening night which included some high level government officials and members of the diplomatic community as well as Lusaka Province Minister Freedom Sikazwe as guest of honour. He was however saddened that the group of officials was missing probably the most important person in his opinion, the Arts Minister, Sylvia Masebo. “She hasn’t been coming to exhibitions; she doesn’t have to come to all of them, but at least the important ones. When we invited her for the independence exhibition it was understood because she was on duty in the Far East,” he said. “But on Sunday obviously she was around. She never misses music events, even if you called her to an agricultural event in Chongwe she would definitely go, but to come to an exhibition, no”. Chulu said as much as he was happy with the presence of other officials from her ministry, he was worried about their level of art appreciation as they were visibly in very new territory and were clearly learning all through the exhibition, which again was not a bad thing. “Okay we don’t know where she is, but at least she understands art more than the people who were present, maybe she would have even bought something. Also the artists were here in numbers hoping to see their minister, but she was nowhere to be seen” he said. He complained that ever since she took office she has never been to the Henry Tayali gallery to familiarize herself, first hand with the operations of VAC, despite the numerous invitations that had been sent to her office. “We need her. We were excited when the president appointed her, we still are, but we just need to feel her presence sometimes” he concluded. Nevertheless, there is not really much to talk about in the on-going exhibition, conceivably owing to the short notice the curators had to prepare. But a few upcoming artists have some interesting works on display. N’gandwe Mwaba’s Umunwe Pakanwa (put your finger on your mouth) is one particular case in point. It depicts a gagged, wide-eyed young lady facing meditatively to the floor with a vacant expression. She wears a small map of Zambia around her neck and a map of Africa as an ear ring. The muzzle on her mouth is screwd into the wall behind her with string, all the same revealing a Monalisa smile, the type you only notice when you look twice. This pen and ink drawing is loaded with metaphor. What is it saying? Is it telling us not to speak, to keep silent and just observe what is happening in the country today amidst the removal of fuel and maize subsidies followed by rioting university and college students countrywide?. Or again seeing that the subject is gagged, maybe she is not silent by choice and is therefore being muzzled. 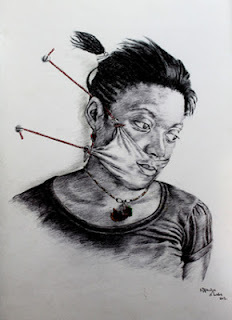 Her necklace represents Zambia and her ear ring Africa, is it saying Zambia is a microcosm of the African continent and it is still not free to speak its mind? Well dear reader, as you can see this paragraph has already exceeded its question mark limit. But young Mapopa Manda’s mixed media painting Donchi kubeba (don’t tell them or ‘don’t ask don’t tell’) is just as thought provoking. Particularly during this period of the on-going subsidies debate. A heated debate that can be seen manifest in television talk shows such as Costa Mwansa’s assignment on Muvi TV where the public saw a seemingly ill-prepared but usually astute Deputy Commerce Minister Miles Sampa torn to shreds by a shrewd and persuasive opponent in the Movement for Multi Party democracies Mohabi Lungu. Donchi kubeba has a richly dense composition with overlapping figures and newspaper cuttings, most of which speak of campaign promises. “For me I think the president and the PF have fulfilled their campaign promises. Well, that is speaking as an artist. I think they have met all artists’ needs according to the manifesto which I have read”, said the young painter on Tuesday. As much as Manda says he is pleased with the status quo. 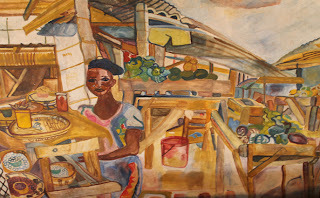 His painting can be read either way by the viewer, like Mwaba’s it is loaded with metaphor. It appears to be the front page of a newspaper, as are all his paintings. It has a masthead that reads Times of Zambia and has small cuttings from The Post. “I use the Times because it represents Zambia’s political history over the years and then I used The Post because I think it did a great deal to support president sata and frankly speaking, he wouldn’t be president without the post” he explained. The central figure in Manda’s Donchi kubeba president Sata portrayed with his finger against his lips in his trademark presidential campaign “Donchi kubeba” posture. Strangely, the president appears to be wearing a general’s uniform, which gives him somewhat the air of a dictator. He is flanked by president Mugabe of Zimbabwe and a police officer to the left while a nurse showing her cleavage in a red bra and unbuttoned uniform holds president Sata’s shoulder to the right. This again interestingly reminds us of the liberties of artistic licence, only an artist can depict the president in such a manner and get away with it. Anyway, as earlier observed, Africa My Africa is not much of an exhibition to talk about in terms of content but we can forgive VAC because they obviously did it in a hurry. But it is hard to forgive VAC for exaggerating government’s contribution to the exhibition and to the arts in general. Even if it was government that sponsored the exhibition there was no need to have “Under the Auspices of The Republic of Zambia and with Direct Support from Cabinet Office and the Ministry of Tourism & Arts” right on top of the electronic invitation card. “Direct support”, so what? It is the government’s duty in any nation to support the arts, and no one should go patting it on the back for carrying out its obligation. To quote the manifesto of Contemporary Fine Art International (Cfai), “For as long as mankind has played a role in this world, artists have recorded that role. Historians and archaeologists study art to learn about past civilizations and the individuals within them. Every era in our history has been recorded, defined, refined, and enhanced by its artists… and today is no exception.” Therefore the government owes artists its allegiance. It is one thing to sponsor an exhibition, but it is another thing to show support by the purchase of works. As of Tuesday this week only one of about forty artworks had been sold. Awe aya ama painting tayaweme, naine kuti na pentapo bwino, (these are not nice paintings, even I can paint better), were the remarks of a staff member at Ababa House’s Pizzaz restaurant during the opening of Laura Chimowitz’s on-going exhibition of about 30 paintings in Lusaka last week. But anyway, as far as opinion and preferences go, ‘to each his own’ as the saying goes. Chimowitz’s paintings are an expression of feeling rather than an actual visual record, and this is what makes her work thrilling. The work reflects a frivolous state of mind, influences of expressionism, fauvism and her Cape Town heritage can be detected in her poetic form of painting. “Painting just gives me joy, an indescribable joy. It gives me happiness and fulfilment, when I look at my paintings and study them; they give me such great happiness and fulfilment. But when I’m even able to sell, that’s just a bonus”, said Chimowitz speaking from the Kabulonga residence she shares with her husband, Roger McKay, a retired pilot, who was responsible for the rescue and airlifting of the Ethiopian Royal family to safety in neighbouring Kenya during the revolt in the early 1970s. 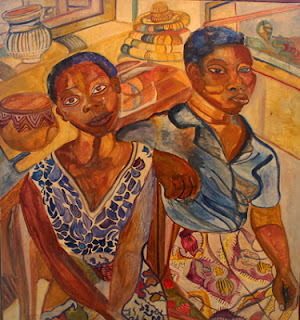 Chimowitz’s work has not changed much over the years, she still paints marketplace scenes on site, and still uses women, especially Bridget, her house servant’s wife as sitting models for her paintings. “I just love painting market scenes. I’m always at Malata market, the people there even know me and they are not bothered when I arrive there with my easel and canvas. Of course they do ask for a little payment but it’s not much” said the 63-year-old, smiling happily. “But my favourite subject is Bridget, she is my helper, Josephat’s wife, look at her isn’t she the most beautiful woman you have ever seen. But sometimes I hire other models and paint them too, and yes of course I have to pay them as well”. 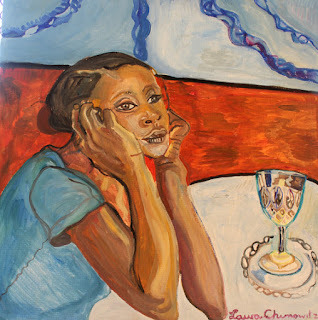 Bridget is the subject of quite a number of Chimowitz’s paintings, such as Woman in Hat and Woman with a Glass. The painter says Bridget is in fact her muse, and that if she (Chimowitz) ever became famous, she would like Bridget to be famous too, drawing comparison to Spanish surrealist painter Salvor Dali, who used his long-time partner and wife Gala who was the inspiration in many of his paintings. Chimowitz is an academically trained artist who studied at Rhodes University in South Africa. “I studied at Rhodes and enjoyed myself so much, but I did not finish the course, I ran off and got married. I also studied at the University of Zambia, but then I got bored. Anyway I quit UNZA because I didn’t want to become a teacher after graduating; the course was in education”. Judging from her tendency to drop out of university, one might assume she has the habit of not finishing what she starts and this just might be reflective in her paintings. Most of them appear unfinished, and although she insists that they are. And walking through her on-going exhibition, one gets the feeling that the work is under-priced for an artist of her talent, standing and experience. Nevertheless, Chimowitz’s paintings are always a delight to look at and she appears to have developed a technique of her own. 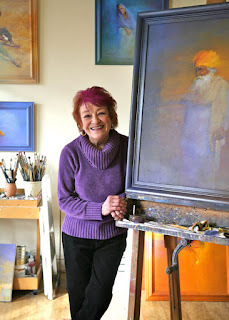 Although she paints with oils, she thins them down with turpentine, making the paint very thin that one could easily mistake them for watercolours. Chimowitz remains a charming component in Zambia’s visual arts landscape and we can only wish she continues being inspired to do what she enjoys most. Getting an artist to speak, particularly to talk about themselves, their inspiration and even their work in an interview is never a simple task. A warden at the US’s Guantanamo Bay is likely to get more out of a detainee, than a writer can get out of an artist, and that is even without the use of waterboarding. And anyway, who needs to know too much about Firoz. Like all artists is his duty not merely that of creatively making a statement about the world, commenting on the nature of human existence or indeed entertaining humankind? Afterall, artists are not on this planet to speak about themselves, their duty is to embellish the planet. Is it not Picasso himself who told us that "Art washes away from the soul the dust of everyday life"? So, less words more art. 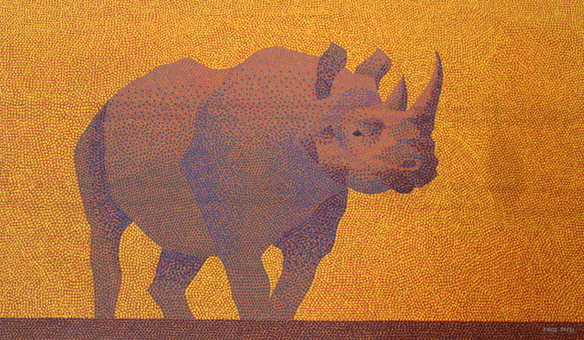 Nevertheless, Firoz appears to have developed and perfected his own brand of pointillism over the past five years. But to cut a long story short, for the less enlightened, pointillism is the term derived from the French art critic Felix Feneon’s phrase peinture au point (painting in dots) used in 1886 to describe George Seurat’s masterpiece La Grande Jatte. Well, that’s according to the trusty old Oxford Concise Dictionary of Art Terms. But anyway, this is not a lesson in western art history, but like Seurat, Firoz’s work has a charmingly luminous quality and true to pointillism, his paintings are composed entirely of dots. Only when one draws closer to them can one appreciate the painstaking effort that went into them, appear a bit like seed mosaics, except done with paint. 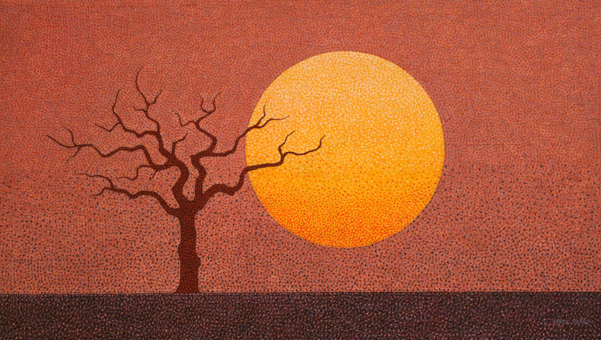 Of course, he is not the first Zambian to dabble in pointillism. It has been used by others, more notably the colour virtuoso Patrick Mumba in works such as his 2007 Tribal Mask (Lechwe Trust Collection) as well as fellow Livingston resident Agness Buya Yombwe in her monumental 1993 masterpiece Our Totems an intricate work donated to Lechwe Trust by Betty Wilkinson and Jodam Allingam. But where Mumba’s pointillism has the texture of paint that has been dripped and dribbled directly on to a flattened canvas, almost in the manner of Pollock, and Yombwe’s has the feel and look of woven, chitenge-like fabric, Firoz’s work is less organic and more symmetrical. It has softer colours, smaller dimensions and miscellaneous subject matter. Furthermore, unlike the other two, who have moved on to different painting techniques, Firoz appears to be adopting pointillism as his signature. “It has become my identity, my finger print” says the soft spoken artist in a voice as gentle as the hues of his paintings. “But this doesn’t mean that I only use pointillism. You will notice that I use three different techniques. 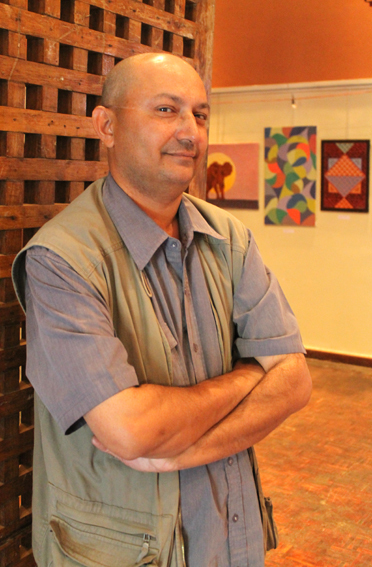 Apart from pointillism, I also use brush strokes as well as a watercolour technique”, said Firoz just before the opening of A Visual Journey of Zambia his on-going solo exhibition at the Alliance Francaise in Lusaka that runs until May 14. In A Visual Journey of Zambia the artist has over 40 recent works with a broad range of subject matter ranging from market scene compositions, wildlife, sunsets and geometric patterns. He said the body of work was inspired by his many travels across the country and that he draws most of his inspiration from the tranquillity that can be found away from the noise of major cities such as his native Livingston as well as Lusaka. And frankly, you can almost hear the tranquillity in his paintings which have a static quality and peculiar silence. “It’s (the exhibition) about Zambia, the colour, the shapes, flora and fauna, patterns and traditions… Zambia is a very colourful country. You can only appreciate this when you get to travel it.” He explained. “And as for the colour in my paintings, I buy basic colours and do all the mixing of the colours by myself, you know, just to create a tone of my own”. He explained that even the canvas that he uses determines the outcome of a paintings and he uses several types but prefers sisal sack, heavy drill cloth and calico. Walking through the exhibition space of his work, one might get the feeling that it becomes predictable, and almost monotonous, a solitary rhino, hippo and elephant against a flat horizon here, the silhouette of a dry tree against the setting sun there. But these small shortcomings can be forgiven, because without doubt, Firoz does bring to contemporary Zambian art a completely new vision. The works on display at Alliance Francaise range between K800 and K6, 500, which means there is something for everyone in the show. For gallery art of this quality, even by Zambian standards these prices are quite reasonable. But in the reality that is the non-buying public of Zambia who are struggling to put food on the table, what with the recent fuel price hikes its nonsensical to spend the equivalent of a minimum wage on a work of art. As much as collecting art is a hobby of the rich across the globe, this is true to our local scenario. It is not uncommon that artists’ works are often bought out of sympathy, as an act of charity, at least to keep the artist off the street. This is also heightened by a fact that there is not really a systematic commercial method of purchasing works of art either through public or private institutions. Speaking of which, the rumour mill has been spinning off its hinges ever since the arts were realigned to the ministry of Tourism and Arts. The word in the corridors is that government, through the ministry, the National Arts Council and unspecified stakeholders are mapping out a policy document for the purchase of art for the decoration of public buildings which of course would be a welcome thing and something that this newspaper column has campaigned for, for at least the past decade, often falling on deaf ears. Then there is also the speculation that Zambian sculptors are very likely to miss out on the opportunity to create work for the sculpture parks designated for the two airports Kenneth Kaunda International in Lusaka and Harry Mwanga Nkumbula in Livingston because they do not meet “certain” tender criteria. But then again, it is easier to hack into the CIA’s computer system than to get anything out of the super stealthy arts administrators in Zambia to verify these rumours. If the situation concerning the two airports turns out factual and all is said and done, let us hope it does not get to the extent where it creates rifts, as did the African Renaissance Monument, a colossal 49 metre tall bronze statue in Senegal. It turns out that Senegalese artists were not given the opportunity to create the US$ 27 million statue and it was instead designed by a Romanian architect and built by a North Korean sculpting company famous for various projects and large statues throughout Africa since the 1970s. London-based portrait artist Oenone Acheson might not be a familiar name on the Zambian visual arts scene, but she certainly has a very special spot in the country’s art history. 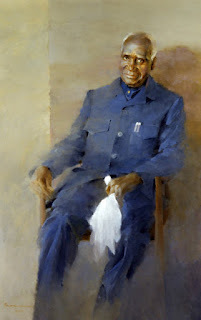 She may possibly be the last artist to have been commissioned to paint Dr. Kenneth Kaunda in the last months of his 27 year reign. In 1990, just before Zambia’s transition to a multi-party state, Zambia Consolidated Copper Mines (ZCCM) commissioned her to paint a portrait of the then president and board chairman for their new boardroom. 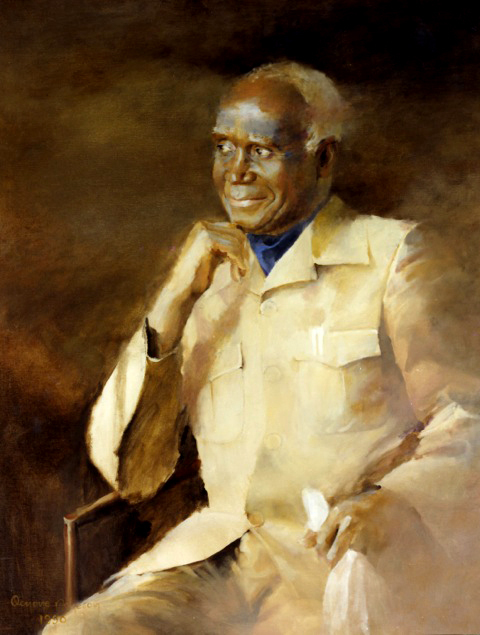 It turns out when Dr. Kaunda attended the opening of the building and the unveiling of the portrait, he liked the painting so much that he took it back to State House and she was called the very next day to paint two more portraits just to be on the safe side. It is not clear where the paintings, three pieces of Zambia’s heritage are today, which in itself is worrisome because when Frederick Chiluba took office the year after they were commissioned, he made it a point to tear down and destroy everything ‘Kaunda’. This is a period when Saddam Hussein Boulevard in Lusaka was renamed Los Angeles Boulevard, and a monument bearing Kaunda’s image opposite the High Court in Ndola was officially defaced among other things. So probably the three remarkable paintings in question may have been destroyed. The paintings show a greying, but vibrant Kaunda clad in his trademark neo-Maoist tunics or safari suits, as some call them, posing in a variety of seated positions. They are in different shades and he bears a warm, fatherly smile in all of them. And in each painting, the artist blends the subject softly into a hazy background. “I remember finding it a little tricky trying to make each one distinctive and different from the others. 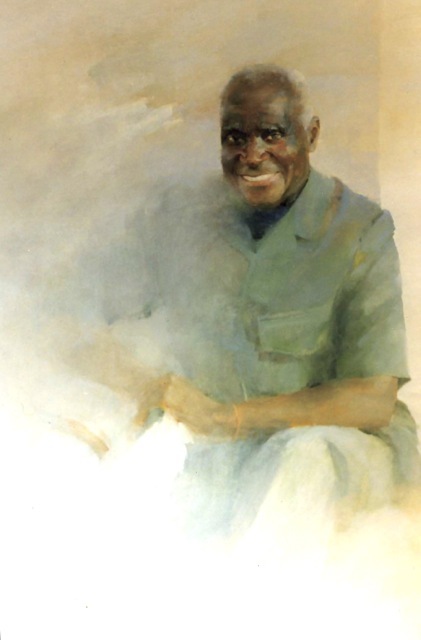 But I did enjoy it enormously - he (Kaunda) had such a marvelous face to paint. Still has, as a matter of fact,” says Oenone pronounced ee-no-nee, who is named after a poem by Tennyson that her mother read and loved so much. Oenone or Noni as she is fondly called says it is also the name of the Greek Goddess of wine. Anyway, writing about Noni is difficult. And it is difficult in several angles. If you focus on the art itself, you rob the article of highlighting her animated personality. Then there is her sidesplittingly critical world view of contemporary art, it is easy to get lost in that too. So here goes nothing. “I was born in South Africa, left at the age of eight and grew up in Northern Rhodesia, leaving it as Zambia in 1974. During this time, I met and married my husband of 52 years, Denis, who was born in Chipata (then known as Fort Jameson) and our two daughters were born in Lusaka,” she tells the Saturday Post “Very happy years indeed, which we look back on with great nostalgia. My husband was very involved in Liberal politics before Independence, which is how he met KK, whom he got to know well. We both regard him with great admiration and affection, and he has visited us in our London home on more than one occasion over the years”. She says Dennis worked in mining and this took them to London for 2 and a half years and then Connecticut in the United States for another 2 and half years. And while she enjoyed their stay in London, she was never too happy in the US because she could never fit in to the repetitiveness of life there. Noni recalls that apart from anything else, it was a wonderful opportunity for her to travel and gather material for her paintings. Not only did she get to travel all over South America, but also India, Thailand, Burma, Japan, and a few other places. She found this exciting as an artist because it was almost impossible to settle down to painting your ordinary man-in-the-street in London with its grey skies and black umbrellas when the couple finally settled there. Luckily she amassed an enormous archive of photos and sketches which will last her for a long time; she still draws from it all the time. 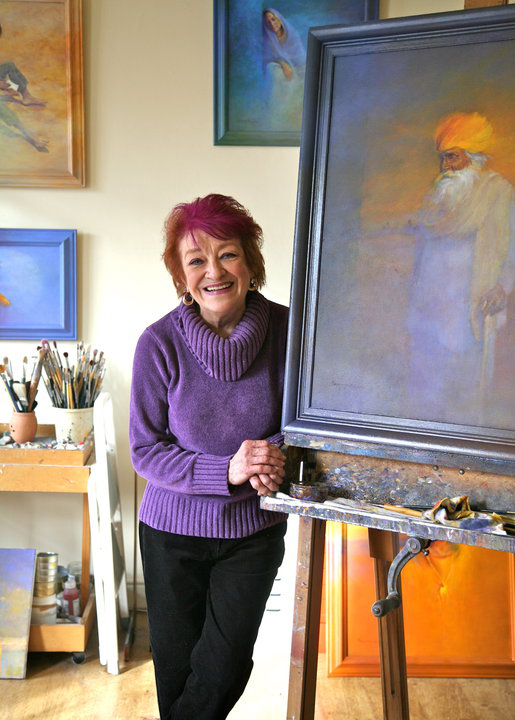 Noni’s portraits bare a very serene and more or less spiritual aura. When asked whether she is a spiritual person she comes up with a delightfully peculiar and somewhat cagey answer. As for her creative process, she says there is something about going up to her studio at the crack of dawn, closing the door on the rest of the world, and simply immersing herself in what she does. She underlines that it is a very solitary profession, leaving one to one’s own thoughts with no intrusions or illusions. “Who knows, maybe I become a different person? Or the person I really am underneath it all? Lord, there’s a thought to ponder. I may have to go and pour myself a drink after this,” she says. Prod her to comment on contemporary art, and the likes of Damien Hirst the most prominent member of a group known as the Young British Artists (YBAs), who shot to fame by incorporating dead animals such as sharks and cows into his art, making him one of the wealthiest artists alive just before the global credit crunch in 2008, and you will not get the kindest sentiments. In 2009, the Sunday Times Rich List projected Hirst’s wealth at £235 million. “I'm totally unqualified to comment on the Damien Hirst and people-of-his-ilk school of art. Mostly because I utterly hate it and think it's the greatest scam ever, I'm thinking "The Emperor's Clothes" - ever heard that fairy story? You may be too young, but look it up if you haven't, and you'll get the allusion,” she says. In fact, as early as 1991, advertising tycoon and one time voracious art collector, Charles Saatchi commissioned Hirst to create The Physical Impossibility of Death in the Mind of Someone Living an artwork that consists of a shark preserved in chemicals. Saatchi is said to have later sold the work in excess of $8 million dollars. “It's ugly, untalented, well-marketed, and - for me - everything art shouldn't be. And he (Hirst) doesn't even do it all himself. And don't get me started on Tracey Emin… unmade beds, for God's sake. I could churn one out every day, except I make mine - and that takes talent, let me tell you” she says. Tracey Emin, one of the YBA’s exhibited My Bed at the celebrated Tate Gallery in London and it was shortlisted for the Turner Prize. It comprised her bed with personal objects scattered around it. Saatchi later bought it for £150,000 and displayed it in his gallery. “So, Charles Saatchi may not be banging on my door. I'm not his style. But I can't begin to describe the pleasure it gives me when someone falls in love with one of my paintings. Especially someone who wouldn't normally buy one. I had a workman in my studio not long ago repairing something, and found him gazing at my paintings,” she explains. As for academic training on her part, she explains that in her day if you are "Good at Art" at school, it translated and in those days, meant that if you painted - say- a boat, and it looked like a boat, you were "good at art" and that is how things were, a long time ago. Beyond art, Noni says she enjoys reading, cooking and making long distance calls to her daughters who live overseas. She does not admit being a slave to fashion, but confesses to a fancy for chic, high heeled shoes. “Yes, I read, and I simply refuse to tell you any titles, because they're all crime novels, and I will lose some charisma, what little I have, by doing so. It's called escapism, I think. And I cook - actually, I'm pretty good at it, even though I say so myself, ask anyone,” she boasts. “Both daughters live in Spain. One has her own Internet company in Madrid; she's her father's daughter that way. And the other is a movie make-up artist of renown in Barcelona. I’m not a fashionista. I like what I like, including ‘killer heels’ and anything with sequins”. The trendy grandmother, with pink dyed hair hates being told what she should or should not be wearing at her age, and ignores all such advisers completely. “Clothes are clothes, right? And who are these people making the rules?” she says. Nevertheless, as much as we can remember her for three portraits of a president, Zambia has not heard the last of Noni yet. She has a pending commission to paint the Zambian Speaker Patrick Matibini from the National Assembly. “I'll keep you posted on that, if you like. I can't start it until I've finished an on-going portrait. And finally dear Andrew, I am so ill-equipped to impart anything at all to younger artists, since I'm never quite sure of how I get to where I get with my paintings. But I would plead with them not to embalm any cows. Any undertaker can do that,” says Noni in obvious reference to the YBAs.